WHAT DO YOU say or do when this happens? Zak Haubrich of Quincy, 21, was killed in a car wreck yesterday near Peoria. The other driver veered out of her lane and hit him head on. 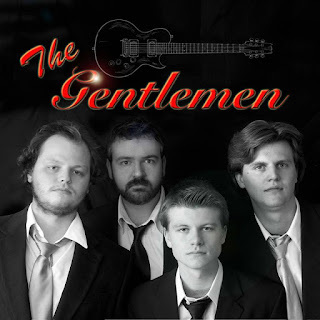 The Gentlemen (from left) - Justin, Jared, Zak, Aaron. Zak was a 2012 Quincy Notre Dame High School graduate and a student at Bradley University in Peoria. He played bass in the awesome Quincy band Jared & The Gentleman. He was a good Second String Music customer and an immensely talented musician. The Haubrichs have been through a lot this year. Peace and prayers to the friends and family. "I don't pray to God to keep bad things from happening. I pray to God to ease the suffering of His people. May He grant eternal peace upon Zak's soul and comfort those who loved him."